Converting numbers in both the metric and standard systems of measurements is a skill that your child will use for the rest of his or her life. To give him or her extra practice with this skill, consider using the conversion problems below. In elementary school, your child will begin measuring with many different measurement units and converting between the units, such as feet to inches. It will also be important for your child to understand how different units within a system relate to one another. For instance, your child should recognize that kilometers, meters and centimeters all belong to the metric system. Before converting units of measurement, students must first understand how the units are related to one another based on their sizes. For instance, a kilogram is larger than a gram. In fifth grade, your child will begin using measurement conversions to solve real-world problems. This may often involve your student working with measurement units that he or she is not as familiar with, such as kilometers. 1. To make enough chocolate pudding for the family you will need 300 milliliters (ml) of milk. How many liters (l) will this be? 2. On a road trip, Ronnie sees a sign that says 212 kilometers (km) to the nearest gas station. How many meters (m) away is the gas station? 3. Barry measured the kitchen table to be six feet (ft) long. How many inches (in) is this? 4. The large bag of frozen peas weighs 32 ounces (oz). How many pounds (lb) is this? 5. Mom weighed the bag of candy for the parade and said it weighed 2.7 kilograms (kg). How many grams (g) is this? 1. To solve this problem, your child must first know that there are 1,000 milliliters in one liter. To determine how many liters would be needed for the pudding, your child will convert milliliters to liters by dividing: 300 ÷ 1,000 = 0.3 liters. 2. Your child will need to know that there are 1,000 kilometers in one meter. Like the above problem, your child must divide to solve: 212 ÷ 1,000 = 0.212 meters. 3. To calculate how many inches long the kitchen table is, your child would need to multiply: 6 x 12 = 72. To be able to correctly solve this problem your child must know that there are 12 inches in one foot. 4. 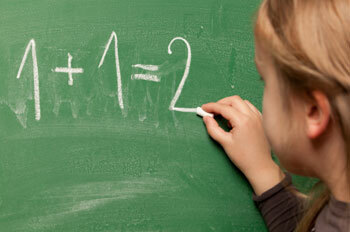 For your student to convert ounces to pounds, he or she would need to divide: 32 ÷ 16 = 2 pounds. This will require your child to know that there are 16 ounces in one pound. 5. There are 1,000 kilograms in one gram. To calculate the amount of grams the candy weighs, your child should multiply: 2.7 x 1,000 = 2,700 grams. In the sixth grade, determining the mode, median and mean in a number series isn't always a simple task. Read on to learn about how you can help your child better understand what these mathematical terms mean and how to solve problems that include them.